Overview: Bantu refers to a large, complex linguistic grouping of peoples in Africa. Nguni refers to a group of Bantu languages spoken in southeastern Africa, primarily in the coastal belt from Zululand to Ciskei in South Africa. 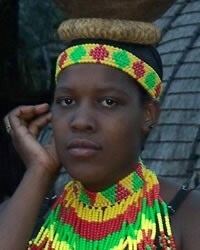 The Ngunis migrated south from north of the Limpopo River in the fifteenth century, also with the Sotho peoples. The Ngunis generally stayed east of the Drakensberg mountains, near the coast, while the Sothos remained west of the mountains. Included in the Nguni group are the Zulu, Xhosas, Swazis, and Ndebeles. -- James Olson, The Peoples of Africa: An Ethnohistorical Dictionary. Westport, Connecticut: Greenwood Press (1996). P. 435.